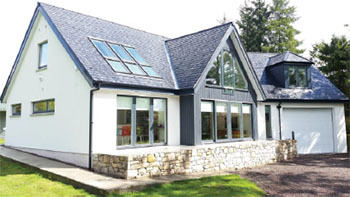 Sips Eco Panels is Scotland’s largest Structural Insulated Panels (SIP) home manufacturer. Based in Glenrothes, it employs 28 staff, having doubled its headcount in the last year. The business has very much been getting ready for a sizeable investment, which will take the next two years to complete. A shareholder investment of £750,000 together with match funding from Business Loans Scotland (BLS) and a grant from the Regional Selective Assistance (RSA) Fund, to finance future investment, will bring about big changes to the firm, which has been operating from the same factory in Boston Road, Glenrothes for over 17 years. New Computer Numerical Control (CNC) machinery is being purchased along with new IT systems, which will bring about more accurate and efficient processes and lead to an increase in productivity. This investment is a result of demand for bespoke, prestigious homes, made with SIP panels. They provide many benefits to a traditional build – the nature of the panel makes it exceptionally strong, whilst largely comprising of insulation. They can be used with any external cladding and likewise can be roofed with slates, tiles or metal roofing. Sips Eco Panels designs, manufactures and constructs homes for developers, self-builders, as well as buildings for schools, and eco-friendly homeless pods and accommodation for charities across the UK. There’s demand too for it to work across Europe. Pat Queen, Managing Director at Sips Eco Panels spoke to fbm. He said: “The business is growing and we’re investing significantly in purchasing state-of-the-art equipment to ensure we can meet demand efficiently and accurately. As developers and builders understand more about the benefits of SIP panels, we are securing more and more business across the UK. Sips Eco Panels has secured funding from the Regional Selective Assistance (RSA) Fund, which will finance the purchase of new CNC machines, as well as support the creation of 15 jobs. Business Gateway Fife’s Business Adviser, Alasdair Busby, has been instrumental in securing funding for Sips Eco Panels through RSA as well as BLS.